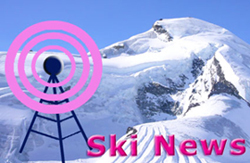 Temperatures have finally dropped in the Alps and fresh snow has fallen on the glacier ski areas that remain open. Lala Stewart from ifyouski takes 1st place in the Ladies ski race! 28 Jul - Are you Pro or Anti helmet wearing? Innsbruck will host its third Olympics, the first ever Youth Olympic Winter Games from 13 to 22 January 2012. The Snowsport Industries of Great Britain (SIGB) are pleased to announce the new venue and dates for Slide 2011.
www.skiinfo.co.uk reports that it's still warm in the Alps which is bad news for snow cover on the 11 glacier ski areas that are currently open in Austria, France, Italy, and Switzerland. Courchevel will stage its annual summer ski jumping contest for the 20th year in August.